Venture beyond the popular tourist spots of Cambodia like the Ankor Wat and Siem Reap and explore the many layers of this beautiful country. On your next visit, include Battambang – the fourth largest city of Cambodia also known as the country’s ‘rice bowl’. The first sight of Cambodia’s gritty riverside city of Battambang will surely enchant you. The glittering gold chedi (local temples), mural-clad pagodas and Chinese shop houses provide a different charm to this city. Don’t let its size mislead you – unlike Phnom Penh and Siem Reap, this French colonial town feels more like a quiet town lazing away on the banks of the river watching the world go by. Battambang is around 2.5 hours by private car or 4 hours by public bus from Siem Reap. From Bangkok, Battambag is about 6 hours by road. Plan before and start from Bangkok before 10 am to arrive in Battambang before sunset. 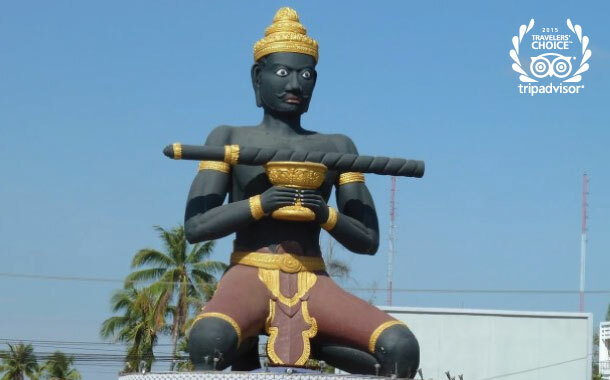 You can either pass through Aranyaprathet/Poipet or Ban Pakard/Psar Pruhm. The famed bamboo train is some kind of “must” when you visit Battambang. The single train railway fell in to disrepair when Cambodia claimed independence back in 1953, the Khmer Rouge making it all but useless during their time in power. These days, very few freight trains run along the track and no passenger trains so the Bamboo train owners have the run of a few miles helping them ferry passengers and all manner of cargo from pigs to broken motorbikes and the occasional chicken. Riding through the jungle and fields on a wooden pallet on tank wheels with an outboard motor for propulsion … not an experience to be missed! Every Thursday night and Monday night from 6 pm, acrobatic circus performances are held by Phare Ponleu Selpak, a NGO school which offers young people a way out of poverty and misfortune by training them in the arts, in particularly circus, music, theater and visual art. The shows are a mix of classical tales and humorous skits, with balancing, juggling, twirling, spinning, dance and more. Located a 10 minute journey by tuk tuk from the center of town, the best idea is to usually arrange with a driver for a return trip. Negotiate a time and return fare as it’s out in the middle of nowhere so you want to be sure you have a ride back into town. Double check before heading out there that a performance is definitely on. The group tours Cambodia and overseas so occasionally performances are cancelled. Several temples (wats) are located in this town with great history and interesting stories behind them. Wat Ek Phnom dates back to the 11th century and is one of the most-visited attractions around Battambang. Even Wat Kandal located north of the iron bridge makes an interesting visit. Another popular wat is Phnom Banan situated about 22 kms to the north of the town but worth a visit. One has to climb up 358 steep steps to reach this temple located on the mountain top. If you are a history buff, visit the Phnom Sampeau which houses a complex of temples and a vase. The mountain is also home to the Killing Caves where the Khmer Rouge executed about 10,000 people during their bloody regime. The name of the Khmer Rouge is linked with incredible horror and uncountable killings. Here, you can also experience millions and millions of bats flying out all at once in a gigantic flow of wings. You can also opt for a kayaking trip down the river from villages 11km from a nearby village into the heart of town. Experience village life at a slow pace by kayaking along the Sangke River outside of Battambang and passing the floating homes and smiling children waving hello! The trip stops at several temples and along the way you’ll see daily life on the river – from fishing to washing to bathing to playing. Even the farm animals are being housed on small cages floating on the water. It’s the countryside around Battambang that makes this region so fascinating. And there’s no better way to see it than by tuk tuk. If you have always lived in a city, just the tuk tuk ride through the villages around Battambang are like seeing a whole new world. No garbage collection, electricity or running water. No supermarkets or malls. No backyards with swing sets and trampolines. It certainly does make you think about the excesses and comforts that you are used to. Known as Cambodia’s ‘rice bowl’, the agriculturally rich area of Battambang is renowned for producing the country’s ﬁnest produce. Locals boast that the area reaps the best rice, juiciest oranges, richest coconuts and sweetest bananas and pineapples. Stroll Phsar Nath, the old market in the historic centre, or Phsar Boeung Chhoeuk and you’ll see vendors selling Battambang’s beautiful produce – mountains of pineapples and coconuts, colourful mats covered with vegetables, ﬁsh ﬂapping in buckets of water and baskets ﬁlled to the brim with vibrant chillies, red onions and fragrant local favourites: lemongrass, kaffir lime, galangal, turmeric and ginger.